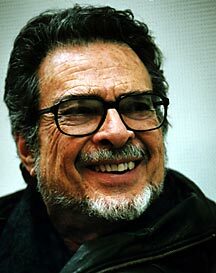 Leon Fleisher's rise to musical stardom was nothing short of meteoric. Spurred on by his mother, who offered him the choice of becoming either the world's greatest pianist or the president of the United States, Fleisher was already giving public recitals at the age of 8. Soon after, he became a student of the legendary Arthur Schnabel, and by 1944, at the age of 16, he was performing with the New York Philharmonic. He later became the first American pianist to take home first prize at the Queen Elisabeth International Piano Competition in Belgium. A stellar concert career followed, in which Fleisher's skills as an interpreter and his deep knowledge of the classical repertoire brought him much acclaim. His recordings in the 1950s and early 1960s were great successes, bearing witness to an amazing control of the instrument. Particularly renowned are the Beethoven and Brahms piano concertos recorded with George Szell and the Cleveland Orchestra, which remain benchmarks for great performance even to this day. But Fleisher's career was tragically interrupted at the age of 37 by the near-paralysis of his right hand. An excessive practice regimen had brought on a disastrous case of repetitive stress syndrome (RSI). After two years of severe depression, Fleisher decided that what he cherished most in life was not just his playing ability but the music itself. "I realized that I was a musician. My life was devoted to music and I had to find another way of serving that devotion." He worked on becoming a conductor, and by 1967 he had founded the Theater Chamber Players at the Kennedy Center in New York. Three years later he was named musical director of the Annapolis Symphony. In 1973, he became an associate conductor of the Baltimore Symphony. While struggling to repair the damage to his right hand, Fleisher discovered a new passion for left-handed piano works. "Actually, I only stopped playing for a period of two years," he insists. "My career never really came to a halt. I simply chose to promote a new repertoire." Such promotion has taken the form of composing his own works and hunting down little-known or forgotten pieces. One such piece is the Piano Concerto for Left Hand by Paul Hindemith, which came to light in 2002. In December, Fleisher, along with Simon Rattle and the Berlin Philharmonic, will give the piece its first public performance. Teaching also represents an important part of Fleisher's musical life. He holds classes at the Peabody Institute in Baltimore, at the Curtis Institute in Philadelphia, in summer academies such as the Tanglewood Music Center (of which he was artistic director for 10 years), and at the Glenn Gould School of the Royal Conservatory of Music in Toronto. Many accomplished pianists--André Watts, to name one--have come under his tutelage. "My love for teaching is very strong. There are things that a musician needs to share, that have to be passed on. But in a way my teaching is very egotistical. I feel I am learning just as much if not more than my students." Fleisher's excitement about education is immediately apparent. "The most important thing is to make students passionate about what they're doing--to make them curious, and to sharpen their hearing." With a smile he describes the mind of a performer in terms that will come as no surprise to high-calibre musicians: "The pianist suffers in fact from a kind of split-personality. He has to be three different people at all times. Person A must hear in advance the music to be played. Person B is the physical performer who controls his fingers over the keyboard. And Person C is the analyst who listens to the music as it comes out and tries to adjust Person B's playing to the satisfaction of Person A. It's a kind of never-ending dialogue. But the role of Person C is often neglected, and too many pianists are dominated by the first two 'personalities,' I think. Your ears have to be your guide at all times." The teacher, Fleisher believes, must be a source of inspiration to the student. (That belief may partly explain why a student at the Peabody Institute once described him as "the Obi-Wan Kenobi of piano teachers.") The tenacity and courage he displayed in successfully recovering the use of his right hand, perhaps the most famous right hand of modern musical history, surely qualify him to give that kind of inspiration. "You could say I've been obsessed with the subject, or maybe just incredibly stubborn." Over the years he tried every remedy imaginable: acupuncture, hypnosis, myotherapy (a form of deep-tissue massage), steroid injections, even carpal-tunnel surgery; psychiatrists have also tried to explain the underlying reasons that supposedly drove him to the point of self-injury. But since 1995, the flexibility of his right hand significantly improved thanks to the deep-massage technique known as rolfing. "When I was finally able to produce the notes as I intended, the sense of reward and relief was overwhelming." BRAHMS: Piano Quartet No. 3 in C minor, op. 60; Piano Quartet No. 2 in A major, op. 26. Monday, March 1, 2004, at 8 p.m. Théâtre Maisonneuve. Info: (514) 845-0532.